So you’re looking for a sales job? There is no better way to significantly grow your income and influence in a short amount of time than working in sales. If you go to SimplyHired.com and search for sales jobs, you’ll find over 1,000,000 positions listed. That’s a lot of jobs. Every single company on the planet needs a sales force. But, few industries offer as lucrative an opportunity as does the field of auto hail repair sales, where some of our best performers earn in excess of $4,000 per week. In our industry, we sell a service through which the cost is primarily covered by insurance. We help automobile owners understand their policies so they can make great decisions that save them money and get an excellent vehicle repair after a hail storm. And they love us for it. Here are a few reasons why a job in hail storm restoration may be a perfect fit for you. If you’re willing and able to travel, you’ve already unlocked a treasure trove of opportunity, income potential, and life experiences. In this job, you’re going to travel… sometimes for months at a time. We service auto owners in hail damaged areas all over the country. So when the storm hits, we go. During this time, you’ll meet lots of new people, get to immerse yourself in and really appreciate the local culture, all while growing your wealth. This lifestyle may not be for everyone, but it may be exactly what you’re looking for. You’ll gain the experience and knowledge to one day start a business of your own (if that’s your thing), and you’ll make as much money as you’re willing to work for. A higher income is a great reason to step into a career in hail damage restoration. In this industry, you truly can make as much money as you’d like. The harder (and smarter) you work the higher your income. You’re not stuck in a cubicle for what amounts to a “fixed income.”. 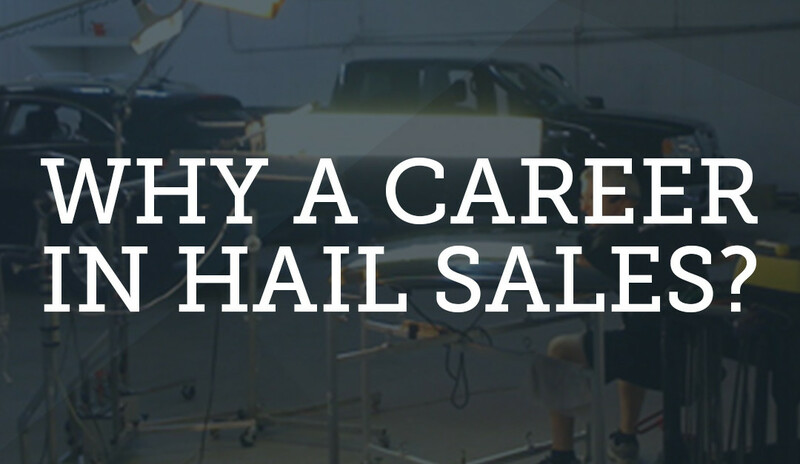 In hail restoration sales, your job is to meet with people who have suffered damage to their vehicles after a hail storm. You inspect the vehicle and help the auto owner understand the claims process, arrange for a rental car and schedule them for paintless dent repair. Again, our services are primarily paid by the insurance company, so you get to help the customer with a huge service at a difficult time in their lives and save them a ton of money. You’re kind of like a hero. That’s why your customers will love you. How many more sales do you think you could close if your customers didn’t have to pay for the repairs? As a traveling salesmen, you’ll spend most of your time knocking on doors, meeting new people and watching your bank account grow. In auto hail sales, you have the opportunity to be your own boss without all the hassles and stress of owning your own business (payroll, taxes, hiring, management, etc.). As a hail repair salesmen, you control your income. Make as little or as much money as you’d like. If you’re a hard-working, determined individual, you can easily make a 6 figure income. Most of our salesmen work 6-8 months and take the rest of the year off to spend time with their families. Few jobs offer that level of freedom. We’ve been doing this a long time. We’ve tested, refined, and simplified our system to be a smooth running machine. It’s time for you to tap in. You’re going to learn all the basics of selling along with additional life skills. The knowledge and experience you gain from our sales training environment will give you life changing experiences designed to prepare you for personal success. You’re going to be working everyday towards a goal. Your goal. Whatever that may be. Not only are you working toward those goals, but you’ll see yourself experiencing breakthrough… that moment when all of your vision and hard work begins to pay off big time. The hail storm restoration sales game might not be for everyone, but if it sparks an interest in you, let’s talk!